In recent weeks, the debate regarding the differences between blogging and journalism has re-emerged. A now-infamous blog post by Jolie O’Dell, which touched on her ideas on the distinctions between blogging and journalism has sparked a good deal of discussion in the blogging community about what the two disciplines have in common. The debate essentially boils down to a larger question of identity for bloggers. Is a blogger a journalist? Is there a sharp distinction between the two disciplines, or has time blurred that line to an extent? Everyone from Ms. O’Dell, to our own Alex Wilhelm and Martin Bryant, to traditional media sources have weighed in on the issue. Here’s where they stand. When blogging first became a popular method of content distribution, this opinion was likely the most correct view. In the earliest days of blogging, even the best blogs incorporated a good deal of opinion and were relatively light on actual journalism. Indeed, this opinion still holds a fair amount of currency in today’s more-developed blogosphere. Broder’s criticism bears a fair amount of weight in today’s blogging atmosphere, where speculation can be erroneously reported as fact. A prime example was Monday’s revelation that a single analyst (Gene Munster of Piper Jaffray) asserted that an Apple television is on the cards for 2012, and many blogs jumped on the story, neglecting the fact that the same analyst made the exact same prediction at the exact same time last year. The unfortunate reality of the short news cycle is that bloggers sometimes have to take a flying leap onto a story to get it out there. A cynical take, no doubt, but a worthy point nonetheless. Blogging has broadened the marketplace of ideas by allowing more people’s voices to enter the discourse. Somewhat ironically, TNW’s own Alex Wilhelm agrees, but for a completely different reason. Put simply, he’s happy that he’s a blogger because he thinks journalism is overrated. In this way, Wilhelm and Broder are in agreement on one key point of view: blogging and journalism are two very distinct entities. Other people see blogging as a step along the road to becoming a journalist. By cutting their teeth writing on things that they are passionate (on fan-blogs like TheOffside), proponents of this opinion say, bloggers can gain the tools to operate in a newsroom environment effectively. A big proponent of this opinion is Shane Evans, Deputy Editor of Goal.com and Major League Soccer’s beat writer for the Philadelphia Union. A journalist by trade and training, Evans also does a fair amount of what could be considered blogging for Goal with his two weekly columns, The Full English and Fish and Chip Shots. 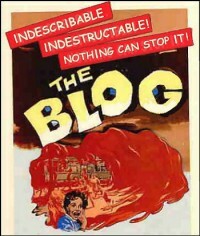 A third group sees the blogosphere as a mixed bag. Rather than judging the medium with wide sweeping strokes, this group judges on the basis of content. This view, which notes a distinction between the products of personal blogs and news sites, holds water in light of expert blogs. After all, if you’re looking for niche information, you’re likely to be better served by visiting a specialist blog rather than relying on the coverage of a writer less well-versed in that particular field. In the view of this camp, the issue boils down to the quality of the information, rather than its source. While a specialist single-issue blogger would not traditionally be considered a journalist, if they are tracking down unreported leads, following developing stories and reporting on current events with reliable information, they are doing what a journalist does. However, this characterization inevitably and necessarily blurs the lines between the two disciplines of reporting. Since the quality of the information is priority number one in this scenario, the best sources will inevitably span a range of disciplines, from conventional media to blogs. In this way, the line between the two disciplines gets fuzzier. The idea of a checklist of characteristics a writer/blogger must possess to be a journalist was first proposed by Jolie O’Dell in her much-discussed blog post of last month. Much like Berman, O’Dell believes that the medium is not the most important distinction. However, unlike Berman, O’Dell sees the distinction as being rooted in background. In O’Dell’s view, the primary distinction stems from the experience a journalist acquires, either from a formal program or from real-life newsroom experience. While the rest of her post enumerates a host of other factors, it’s implied in the post that these factors are all understood through the training that she refers to. The crux of O’Dell’s argument is that “the journalist’s work has been pruned mercilessly by the red pens of professors, peers, and editors.” As a result of this relentless editing and critiquing, the journalist is not wedded to his or her words. Because of this detachment from the content of the story, a journalist is better able to be objective source, or so O’Dell asserts. Our own Martin Bryant also has his own take on this concept. Riffing on O’Dell’s list, Martin says that some of O’Dell’s points are well-intended, but are less relevant today than in the past. In short, both O’Dell and Martin see journalists as technicians practicing a certain skill-set with precision. However, as Martin has acknowledged, bloggers often do pretty much the same thing. All of these views on the distinction between blogging and journalism have redeeming points. Those that draw a sharp distinction between blogging and journalism are correct in asserting that much of the blogging world has little interest in proper journalism. Indeed, a large portion of the blogosphere is still dominated by opinion writing. By the same token, those that see the blogging world as a training ground for future journalists are equally right. In certain disciplines, a fresh new crop of journalists have learned the skills of journalism on fan blogs and have been snapped up by larger media sources because of their specialized expertise. Among the more professional blogs out there, the quality and style of writing continues to approach, or even exceed, that of conventional media sources. This fact lends credence to the opinion that content is king, as stated by Berman, O’Dell and Martin. O’Dell does have a legitimate point, though, when she sharply underlines the differences in the skill sets of journalists and other types of writer. If you believe Alex, this is where I take off my journalist hat and put on my blogger hat. In the end, I believe that a combination of Opinions 2, 3 and 4 best encompasses the odd relationship between blogging and journalism. Blogging has undeniably allowed many aspiring journalists to learn the skills necessary to become journalists. Blogging teaches these writers how to organize their arguments, form coherent ideas and how to research their chosen issue. As bloggers become better and more experienced, however, they can become some of the best resources in their given field, especially if that field is currently underserved. I don’t know what it says about the American political process, but for the better part of the 2008 election cycle, the best political coverage anywhere was available on a blog written by a guy who named himself after a chili pepper. Of course, when his site attracted more attention, he revealed his real identity and almost immediately became one of the US’ foremost political analysts, while his site was bought out by the New York Times. I am, of course, talking about Nate Silver of FiveThirtyEight.com. Part of what made Silver’s analysis so compelling, though, was how well he was able to spin it into stories. This was largely down to a little-known fact about Silver’s background: he’d been trained as a journalist. While he was a student studying Economics at the University of Chicago, he’d written for the school’s bi-weekly newspaper (a publication which also counts David S. Broder as an alumnus). In the end, there’s little that distinguishes a good blogger and a good journalist, and the line between the two is hazy at best. A blogger may inject a little bit more analysis into a post than a journalist does in a news article, but when a blogger tracks down sources, does investigative reporting, and presents the facts clearly and fairly, that is journalism, plain and simple. Thanks to ABC for the screen-grab.